As Vaudeville was meeting a rapid demise towards the end of the 1920s at the hands of talking cinema and broadcast radio, so too were the dreams of aspiring drummers and drum makers alike. Just as the curtain was coming down for good on Vaudeville, the Great Depression landed and a manufacturing startup of any sort was all but impossible for a one man operation such as that of A. A. Young. But a decade earlier, the twenties were just beginning to roar and to an aspiring drummer and drum maker from Lewiston, Maine the lights of Lynn, Massachusetts must have shined brightly. Lynn, Massachusetts was long known as an industrial hotbed along the Massachusetts North Shore and more specifically as the center of shoe production in America. By the early 1900s, it is said to have been the largest shoe manufacturing city in the world. This reputation as a cobblers haven may have helped draw A. A. Young to Lynn. Government records from his marriage to Edith M. Sampson in 1894 list Young's occupation as that of Shoemaker. Known more for industry than for culture, Lynn had a thriving theater scene nonetheless. Venues included the Olympia, B. F. Kieth's Theatre, the Mark Comique, and Katz's Auditorium Theatre. In 1915, the new 2000 plus seat Strand Theater opened on Union Street and it was here that Young would soon find regular work as a musician. Arthur Amos Young (1875 - 1957) was born and raised in Lewiston, Maine. The youngest of four children, Arthur attended school and was a laborer as a young man. His father Ezekiel was an engineer and a Free Mason who retired to Harpswell, Maine as a farmer late in his life. Arthur would live with his aging father in Maine until at least 1900. By 1909 Arthur had moved south to Lynn, Massachusetts with his wife and son. A drum teacher by day and a theater musician by night, Young also had a strong interest in building and selling drums and percussion accessories. City directories throughout the 1910s list Arthur A. 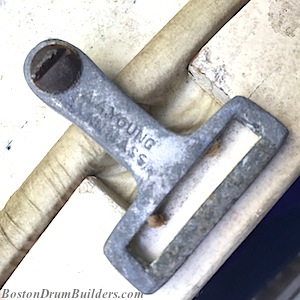 Young as a drum manufacturer at 113 Munroe Street just off Central Square. In 1920 his studio moved to 341 Union Street where he would remain for more than a decade teaching students and selling drums in the heart of downtown Lynn. Not unlike modern times there were tiers amongst drum builders of the 1920s. There were the well established companies of varying sizes, then there were the smaller artisan makers who hand crafted only a select number of instruments, and then there were the A. A. Youngs of the world. Young maintained only a minuscule industry presence and was more of an assembler and a dealer rather than a manufacturer of significance. For such a small timer who peaked in the early 1920s, it's a wonder that anything at all can be uncovered on Young. As nearly 100 years have disappeared since, so have most of the A. A. Young drums and sticks used to keep the beat in the theater orchestras of Lynn. Of the few surviving examples left to tell the story, most are dusty, dying, or incomplete. 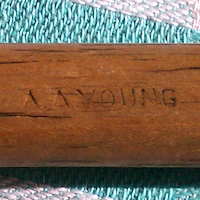 Young's own advertising would suggest that his "Special Orchestra Drum" was more of a budget level instrument than a professional model. It's likely that the shells and hardware were sourced from other more prominent companies in New England and assembled by Young. Going by the few examples of his work to surface, there are few distinguishing features unique to Young as a maker. Later instruments sometimes appear as a curious hodgepodge of parts taken from different companies and different eras. Perhaps A. A. 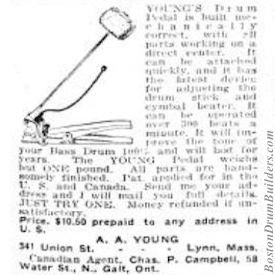 Young's most notable contribution to percussion manufacturing was a bass drum pedal design for which he was granted a Canadian patent on November 21st, 1922. It appears that while he applied for an American patent as well, only the Canadian patent was granted, maybe because Young's design was not so different the from other piano-action pedals available at the time. In the end, Arthur Young was like so many others in his day. He played drums and he built drums. 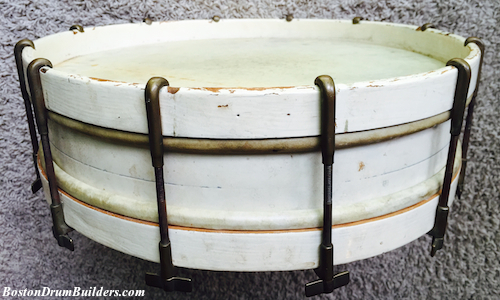 Most early 20th century drum companies were started by drummers after all. Only the biggest and most influential makers left their mark and only the strongest would weather the economic climate of the 1930s. Young's manufacturing prowess never grew that large or powerful and ultimately he has faded into obscurity. Do you have a drum made made by A. A. Young? I'd love to hear from you! Feel free to send Lee an email anytime at lee@vinson.net. And for more on the early 20th century snare drum makers of Boston, Massachusetts, please visit BostonDrumBuilders.com.